Many patients see ads on TV that show nearly miraculous – and instantaneous – results with dental implants. The commercials seem to be too good to be true, and they very often are. Our dentists at Meadows Dental Group have the skill and experience to deliver quality tooth replacement with dental implants. We also pride ourselves on honesty and integrity, meaning we will openly discuss whether or not implants are your best option at a comprehensive exam. Call Meadows Dental Group at 303-790-2323 for an appointment with our implant dentists. We welcome patients from Lone Tree, Centennial, Highlands Ranch and other nearby areas. What about Teeth in 1 Day? Implant root: The implant itself, this is a small titanium screw that is placed beneath the gum tissue. Titanium bonds with bone tissue in the jaw, which lays the groundwork for the restoration. Abutment: This clip attaches to the portion of the implant that appears above the gums. 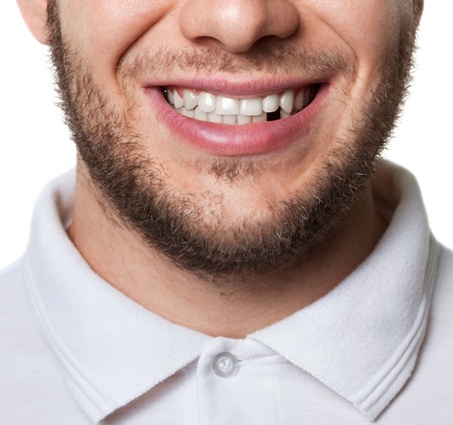 Restoration: Usually comprising a dental crown or a denture, the implant process is complete once our dentists attach a permanent restoration to the abutment. Despite what you may have heard, dental implants are rarely an overnight solution. Good results take time, and patients with reasonable expectations typically enjoy the best outcomes. Durability: The dental implant itself can last a lifetime with proper care. You may need to replace the restoration after several years, but our dentists’ skill and collaboration with an excellent dental lab means your implant will be completed with a quality restoration. Stability: Restorations attached to an implant are anchored in place like natural teeth. You can eat and speak like normal without worrying about the slippage or loss of function that can occur with dentures. Only implants replace the entire missing tooth: Crowns, bridges and dentures fill the space, but implants actually replace the root and support a restoration above the gum line; it’s as close to natural tooth anatomy as modern dentistry can get. Dental implants preserve the health of all of your teeth: When you’re missing teeth, the remaining teeth shift to fill the gap. This results in overcrowding, bite misalignment and other problems. Luckily, the comprehensiveness of the implant protects our patients from these negative effects of tooth loss. Implants stop bone loss: Missing teeth also trigger a loss of bone density at the former site of the tooth root. As an artificial root, dental implants stimulate bone tissue in the jaw, which is beneficial for oral health and functionality. Patients who are missing teeth often develop the appearance of a sagging face. You might look angry or sad, even when you’re not, but the face in the mirror can negatively affect your mood. Dental implants help you reclaim your facial shape, completing your smile and enhancing your overall appearance. You are free from gum disease: Periodontal health is absolutely critical to successful implant placement and healing. If you have gum disease, our dentists can perform gum treatment with scaling and root planing, or refer you to a periodontist for specialized care. You don’t smoke: If you smoke, you need to quit at least 4-6 weeks prior to the initial implant procedure and refrain from smoking while the implant heals (optimally, you’ll quit altogether). Smoking is a major risk factor for gum disease, which counters the healing that needs to occur for the implant placement to be successful. You have sufficient bone density to support a dental implant: Panoramic X-rays will give our dentists a look at the bone tissue. If the density is low, that doesn’t rule out implants entirely; our dentists may recommend a bone graft to enhance the underlying tissue. Chronic conditions like diabetes and immune disorders might also make dental implants inadvisable. The purpose of your comprehensive exam at Meadows Dental Group is to evaluate your oral health and overall well-being, then discuss the full range of treatment options. Our dentists will never force dental implants on you, but we’re happy to tell you all about how they apply to your specific situation! 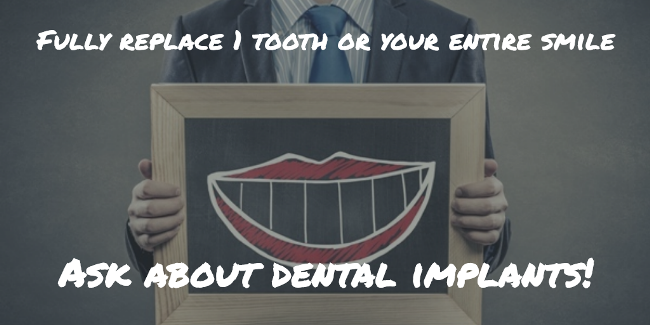 What Should I Expect from Dental Implants? Healing after implant surgery takes 4 to 6 months. The gum tissue must be healthy and the implant root must be fully integrated with the jaw bone in order for the restoration to attain the cosmetic and functional results you want. No dental treatment is more comprehensive than implants for missing teeth, but healing time is absolutely crucial to the success of the procedure. Practice good oral hygiene: Brush and floss your teeth regularly. Our dentists might recommend an oral rinse to keep the site of the implant clear of plaque and debris. Don’t smoke or use tobacco: If you used tobacco prior to the implant surgery, the success of the implant’s integration with your jaw bone hinges in part on your cessation of cigarettes and other products. And if you didn’t smoke, chew or vape before, now is not the time to start! Maintain all followup appointments: Our dentists will advise you how often you need to return to the office. These visits are intended to make sure that the implant is healing correctly and the osseointegration process is proceeding as planned. Your specific directions may vary. Our dentists may prescribe a brief course of antibiotics or recommend select oral hygiene products to assist with healing. Pain and swelling should subside within a few days after the procedure. Eating soft foods and avoiding alcohol for one to two weeks post-surgery will further advance the healing process. Meadows Dental Group is dedicated to achieving the best results for our patients. If you have concerns or experience a dental emergency, we will provide you with timely care. For crowns and other restorations, Meadows Dental Group partners with a reputable dental lab near Denver. We often refer patients directly to a tech at the lab so they can review the size, shape and color of the restoration in order to ensure that it meets their needs and goals. Complementary treatments, such as gum therapy, bone graft, extractions, etc. Our dental financing provides flexible options to help you fund dental implants and other services. Speak to one of our helpful team members about no-interest financing for implants today. Can I Get New Teeth in 1 Day? Many patients ask us if they will leave our office with completed dental implants. 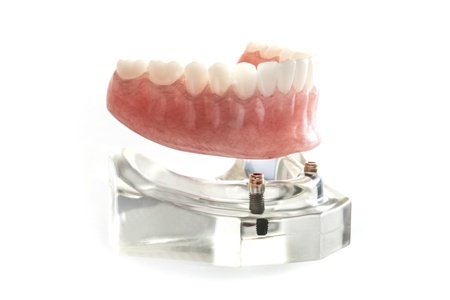 For edentulous patients, the thought of having all new teeth in a day is enticing. However, the reality is different from what you might see on TV. Complete restoration with dentures can be completed in one day. Our dentists place four implants, then mount a full denture on the posts at the same appointment. However, successful restoration with a crown should not be attempted as a same-day procedure. To understand why, picture a basketball hoop newly stood up in fresh cement. You and your friends don’t want to play with it immediately because the post will shift and the hoop will not be anchored in the ground correctly. A dental crown supported by an implant operates according to the same principle. Immediately attaching a permanent crown (the basketball hoop) to a newly placed implant (the cement foundation) will reduce the stability of the restoration as a whole, making it more likely that the replacement tooth rests at the incorrect angle. There is no substitute for full healing and placing the crown at the right time. The examination marks the beginning of your relationship with Meadows Dental Group. During this appointment, our dentists thoroughly evaluate your oral health, as well as treatment options for missing teeth. Learn about your dental implant candidacy, the implant process and more by calling 303-790-2323 today. 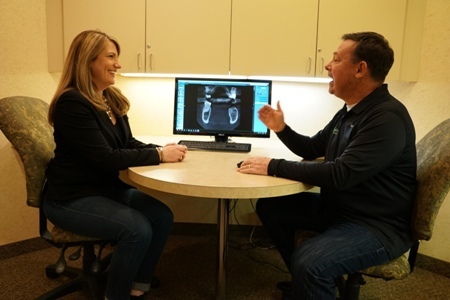 Meadows Dental Group has been in the same Lone Tree location for nearly 20 years, and we are proud to serve patients throughout Colorado and nearby areas including Highlands Ranch, Centennial and more.